Holly qualified from New College Durham, through Leeds Metropolitan University, with a 2:1 BSc(Hons) degree developing a keen interest in gait analysis and biomechanics of the lower limb. She focused this interest in her dissertation researching peak planter pressures in the foot during dynamic walking. Holly is passionate about all aspects of podiatry and chiropody specializing in functional and structural biomechanical conditions. 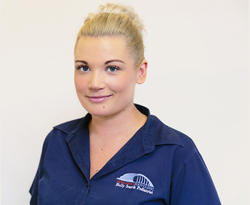 Together with Newcastle Foot Clinic Holly is looking forward to extending her all-round knowledge and increasing the scope of her expertise in biomechanics and gait analysis. Before progressing into Podiatry Holly developed her sporting knowledge, completing a 2 year sport and fitness development course, and hopes to incorporate this knowledge into her biomechanical and general practice.